Getting a win against Barcelona is not surprising owing to their good start to the season but Eduardo Berrizo will be pleased with his side’s style of at the Estadio Municipal de Balaidos against Champions, Barcelona. Rafinha’s injury may have added to Barcelona struggles in the middle of the park but Celta Vigo did well to thrash the Champions 4-1 which saw them move to the top of the league level on points with Real Madrid and Villareal. Neymar’s goal after Nolito and Iago Aspas’ brace only proved a consolation for Barcelona. Guidetti confirmed maximum points for Celta about five minutes after coming on as a substitute. Luis Enrique’s men will host Las Palmas this weekend and will hope to get back to winning ways. Celta Vigo however, will hope Nolito and Iago Aspas continue their good goal scoring form when they travel to Eibar. Rafael Benitez Real Madrid finally conceded a goal but Karim Benzema’s top performance in front of goal was enough to hand three points to the Blancos. Cristiano Ronaldo failed to score in his second consecutive match after scoring eight in the previous two which leaves him 2 goals behind Raul Gonzalez on Real Madrid’s all-time goal scoring chart. It was definitely a tough win for Real Madrid but Benitez will be excited they got through. Benzema gave Madrid the lead in the 19th minute before scoring the winner 3 minutes after Merino’s 67th minute equaliser for the host. Real Madrid will now host a struggling Malaga side this weekend as they hope to hold on to the top spot. Athletico Bilbao, currently 15th on the table will travel to Real Sociedad in an all-important match. David Moyes, will hope to start a good run of form now after his side’s poor start to the season. Imanol Agirretxe’s hattrick away at Granada gave Sociedad their first win of the season which is expected to be a big boost ahead of the visit of Bilbao. An own goal from Malaga’s Fernado Tissone was enough for Villareal to get all three points at the Estadio La Rosaleda which leaves Malaga in the bottom three. Malaga’s quest to find form and get their first win of the season will not be helped however with their next match been a trip to the Bernabeu. Sevilla also remained in the relegation zone after five Liga matches with their recent 2-0 loss to Las Palmas. Sevilla will now have an uphill task when they welcome Rayo Vallecano this weekend. Vallecano got all three points at home to Sportng Gijon on Wednesday and will be going to Sevilla full of confidence. Valencia’s struggles continue as they fell to a 1-0 defeat at Espanyol. Eibar played out a 2-2 draw away at Levante to maintain their good start to the season leaving them on 7th position. With visit of Celta Vigo in sight, Eibar will hope to continue their impressive start to the season. Athletico Madrid remain on course for the title challenge after Antoine Griezmann scored a brace to lift them over Getafe moving them to fourth on the table. 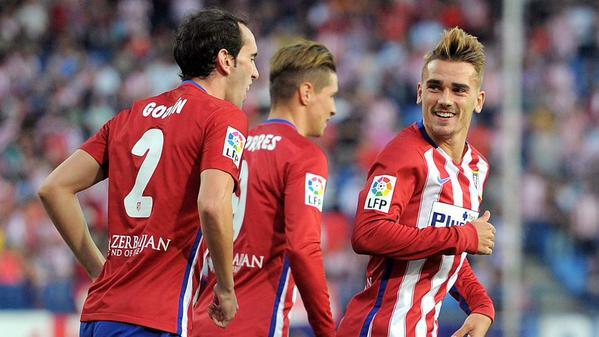 The pick of week six fixture at the weekend will be Athletico Madrid’s visit to Estadio El Madrigal to face Villareal. Real Madrid moved top of the Liga table with 13 points and a goal difference of 13. Celta Vigo moved to the second spot level on points with Real Madrid but a goal difference of 8. Villareal’s 13 points and goal difference of 7 place them on the third spot with Athletico Madrid and Barcelona staying 4th and 5th respectively with both on 12 points. At the other end of the table, Athletico Bilbao and Levante have 3 points and a goal difference of -4 thus placed 15th. Getafe and Granada are placed 17th and 18th respectively with 3 points but inferior goal difference while Malaga and Sevilla are sitting comfortably in the 19th and 20th positions respectively. In the race for Pichichi, Real Madrid duo of Cristiano Ronaldo and Karim Benzema are joined by Nolito of Celta Vigo on five goals each. They are closely followed by Imanol Agirretxe of Real Sociedad on four goals. Celta Vigo’s duo of Hugo Mallo and Nolito are now joint top assist leaders with Real Madrid’s Gareth Bale with three assists each.